Today is a good day to throw yourself into your own personal labor of love. This isn’t about punching a clock somewhere and wishing the day was over so you could get back to whatever it is you really enjoy. It’s about finding that thing you truly want to do and figuring out a way to turn it into a livelihood. The Eight of Pentacles is first and foremost a craftsmanship card. It refers to honing and refining your craft in a way that only you can. What better representation of this is there than a spider spinning a web? There is perfection in the imperfection, as seen in the elegant gossamer strands that interconnect with one another to create a masterpiece. 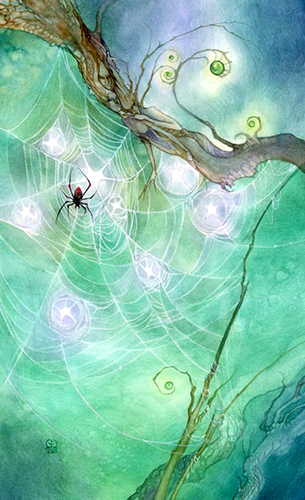 The “pentacles” in this rendition are eight shimmering stars woven into this spider’s web. The morning light reflects off of them — a testament to this spider’s early start. She wouldn’t rise so early to do something she didn’t want to do, and ideally neither would you. The Eight of Pentacles can refer to an all-work / no-play mentality. But this is all relative, as the hours that you’re putting in will likely not feel like “work” at all. Not if you truly love what you do. This is about being fully engrossed in what you’re learning, creating or developing. It may be that you’re considering going back to school or learning a new trade. Or you could be working on your own personal Magnum Opus. Getting an advanced degree, writing a dissertation, launching a new business — these are all good examples of the Eight of Pentacles’ labor of love energy. Take some time today — even if you’re still somewhere punching that clock — and think about what you really want to be doing. Chances are good that once you start seriously thinking about your options, taking steps toward making them happen will come to you naturally. The card used for today’s tarotscope — Eight of Pentacles — is from the Shadowscapes Tarot series by Stephanie Pui-Mun Law and Barbara Moore, and can be purchased directly from the Shadowscapes website or through the deck’s publisher, Llewellyn. This deck can also be downloaded as an app for Android, Ipad and Iphone devices through the Fools Dog website. Please also “like” this deck’s Facebook Fan Page!